Can Bilinguals See it Coming? This study investigates the differences in 1st language (L1) and 2nd language (L2) sentence comprehension. More specifically do the struggles in understanding L2 sentences stem from incorrect word anticipation? The current study is based on the foundation of DeLong et al. (2005) that the comprehender has the ability to understand and interpret language before it is actually presented using the context of the sentence. The process of predicting words is crucial in the amount of time it takes to comprehend the sentence. A related prior study found that L1 comprehenders are better at predicting words than L2 comprehenders (Martin et al. 2013). A limitation of these findings is that the investigation included a manipulation of the preceding article that does not exist in the L1 of participants. The results could be explained by the ability to predict the noun but the failure to anticipate the phonological agreement rule that is non-existent in their 1st language. The current investigation tests the anticipation of words in sentences that use the same linguistic features in L1 and L2. One prediction of this study is that L2 event related potentials (ERP) will measure the same as L1 if they anticipate the noun and gender agreement article at an equivalent rate. If L2 fail to correctly predict the noun or gender agreement article than Martin et al. (2013) findings will be replicated. Participants involved were 18 native Spanish speakers, 18 Spanish-Catalan early bilinguals, and 18 French-Spanish late bilinguals. The French-Spanish test subjects had to pass a language proficiency test to continue with the study. The test stimuli was 52 highly constraint sentence frames that were completed by an expected noun and unexpected noun (see Table 2). This resulted in 104 experimental sentences that were then randomly assigned to one of two lists. Each list only had one version of the sentence, either the expected noun or the unexpected noun. Participants were presented with the sentence frame as a whole on a computer screen and asked to press the space bar once they finished reading the sentence frame. Then the rest of the sentence appeared one word at a time (200 ms- word duration and 500-ms interstimulus interval [ISI]). 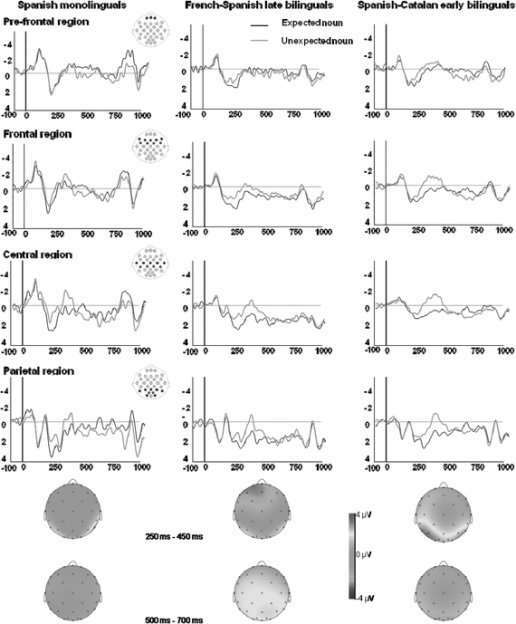 Using Electrophysiological (EEG) data to measure the ERPs researchers focused on the N400. N400a refers to the measurement of activity while reading the article that precedes the noun while N400n refers to the measurement of activity while reading the expected or unexpected noun. N400a was measured in two time windows between 300-500ms and 500-600ms. The N400 effect was measured significantly between all three experimental groups on the preceding article and on the noun. 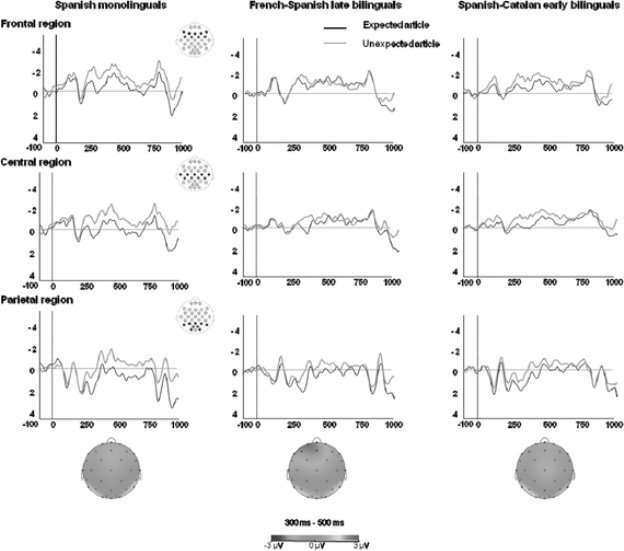 The extremely similar results between monolingual, early bilingual, and late bilingual participants suggest that word anticipation processes are at play in all three groups. 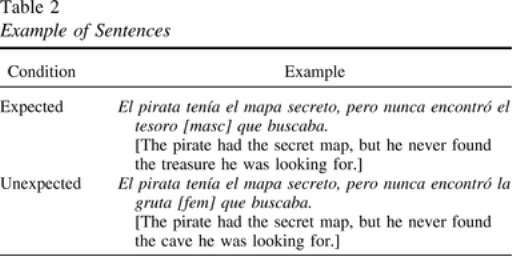 This supports the theory that L2 word prediction processes are just as good as L1 when the two languages are closely related such is the case in this study between Spanish and French. These results contradict the earlier findings of Martin et al. (2013) that in Spanish English bilinguals L2 fail to correctly anticipate the article and noun. As previously stated the flaw in this design was using a grammar rule for the preceding article that did not occur in both languages. This confounded their results by masking the L2 ability to correctly anticipate the noun when participants incorrectly anticipated the preceding article. The results from this study suggest that L2 comprehenders are able to use sentence context to predict upcoming words helping them to understand the sentence, at least when the two languages are related. Why is it then that L2 comprehenders still have difficulties in sentence comprehension? Further research is needed to investigate these hypothesis. These findings have a great impact on the field of linguistic psychology but they need to be replicated. Martin, C. D., Thierry, G., Kuipers, J.-R., Boutonnet, B., Foucart, A., & Costa, A. (2013). Bilinguals reading in their second language do not predict upcoming words as native readers do. Journal of Memory and Language, 69, 574-588. "Word Anticipation in L2 Sentence Reading." UKEssays.com. 11 2018. All Answers Ltd. 04 2019 <https://www.ukessays.com/essays/psychology/word-anticipation-l2-sentence-reading-2695.php?vref=1>. "Word Anticipation in L2 Sentence Reading." All Answers Ltd. ukessays.com, November 2018. Web. 24 April 2019. <https://www.ukessays.com/essays/psychology/word-anticipation-l2-sentence-reading-2695.php?vref=1>. UKEssays. November 2018. Word Anticipation in L2 Sentence Reading. [online]. Available from: https://www.ukessays.com/essays/psychology/word-anticipation-l2-sentence-reading-2695.php?vref=1 [Accessed 24 April 2019]. UKEssays. Word Anticipation in L2 Sentence Reading [Internet]. November 2018. [Accessed 24 April 2019]; Available from: https://www.ukessays.com/essays/psychology/word-anticipation-l2-sentence-reading-2695.php?vref=1.